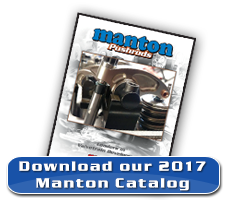 Manton Pushrod Tips are CNC machined in house to ensure quality control and versatility. Made from high impact, wear resistant 8620 barstock, they are then case hardened, heat treated and tempered. In addition we also offer a pushrod tip made of H-13 tool steel. This material is heat treated, triple tempered and salt bath nitrided. 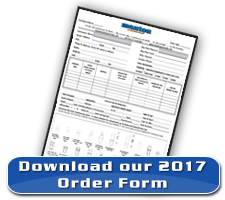 Tool steel pushrod tips are almost always used in conjunction with tool steel rockerarm adjusting screws.We also have two designs of our proprietary copper alloy inserted tip available for our .281 and 5/16 ball adjusting screw. One design is a radius cup and the other is a v cup. The V-Cup design was the original answer to a major fit problem that started to become an issue as the rockerarm ratios approached 2 to 1. The lack of working room between the rockerarm body and the pushrod had been reduced to the point where it became necessary to decrease the adjusting screw ball diameter and the problem was solved. Several other problems then appeared mainly because of the very small contact ring in the pushrod end. We have made a few small changes that have shown excellent results. •	Reduced heat generation = Improved reliability. •	Reduced surface loading = Resulting in extended service life. •	Depth of engagement = Reduces the possibility of damage during valve train surge. •	Overall design = Durability and cost effective. •	Longer hydrodynamic wedge = Cooler running temperature. •	Pro Stock, Competition Eliminator, Pro Mod, Super Stock. •	Pulling Trucks and Tractors.